I'm currently using a trial of version 2.5.4752 and having trouble setting a cookie using a datasource. When I run or verify the test, it doesn't include the cookie yet when I use the same datasource on a querystring, it includes it correctly. 1. Before recording a test case, clear cookies for the tested domain. This is done automatically by the recorder. However if the recorder is not used, this should be done manually. 2. Start recording from the beginning, including the very first request that establishes a session. Also, cookies are auto-correlated by StresStimulus automatically, so parameterization is not required and even can break the session integrity during the test run. It looks like your 2-d screenshot displays the 1-st request, because the response contains the Set-Cookie for ASP.NET session. So you followed the rule # 2. However, your 1-st request already includes SC_ANALYT ICS_GLOBAL_COOKIE, which should not be there, if you would follow the rule 1. if you do not use the recorder, then clear cookie manually. Also, typically cookies are generated by the server, so please make sure that you really need to parameterize the SC_ANALYT ICS_GLOBAL_COOKIE with the dataset, because the requests with altered cookies can be rejected by the server. In my scenario I must parameterize the sc_analytics_global_cookie because it enables me to track a person across muliple visits/sessions therefore I wish to run w/ the same cookie across multiple test runs. From what I understand you're saying - the tool does not work this way?? In this case, it is fine to not clear cookies before recording by unchecking "clear cookie" in the recorder (which you probably already did). You can also keep the dataset parameterization. Additionally, you need to enable browser caching and set "New VU %" to 100% 0% ([VK] corrected on Jan-23), as the browser caching is disabled by default ([VK] the screenshot was replaced on Jan-23 to reflect 0%). Thanks, I tried these options with no luck. The tool is not shipping the cookie I'm specifying on the first request. Any other thoughts? The .ssconfig file does not contain enough information. Can you upload your test to our secure support repository, so I can examine it. To do so, in StresStimulus main menu -> support options, select " upload support case"
I will check and let you know what to change. Your dataset is defined to store only the cookie value, not cookie name. So you should use it to replace the just recorded value and keep everything else in place. Also, please use VU_Bound data-binding method so every VU will use the same cookie on all its requests. 2. 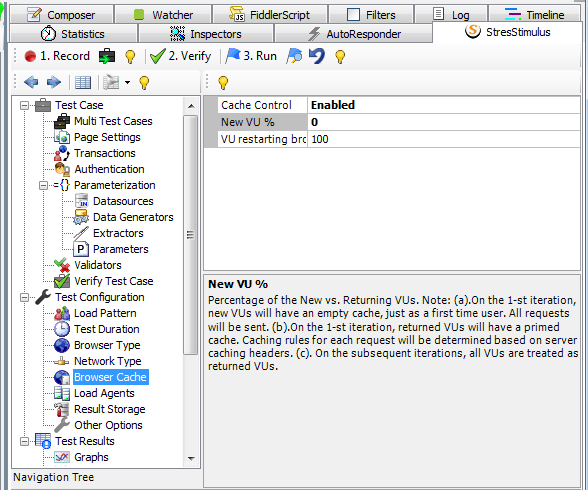 Enable browser caching as shown on the screenshot in my previous post above. Please note that "New VU %" should be 0%, not 100% as I incorrectly said before. (I placed a few corrections above in bold). As a result, the tracking cookie will be parametrized. The cookie is now being shipped correctly according to your configuration notes. I also set the % of new VUs restarting browsers to 0%. This enables me to precisely control the way my users behave! Regarding your email: the extra cookie was my fault. I manually added it as I was testing something so you should not have to account for this unless it's in the http spec. Now - on to authentication! Thanks for letting me know that everything works well. if you will have any questions on authentication, just start a new thread.